Thank you for giving us the opportunity to introduce our banquet and meeting facility to you.The Festsaal is adjacent to the Black Forest Inn and its lovely outdoor garden, a favorite of locals and visitors for over 35 years. Your group can enjoy its own private space overlooking the garden for breakfast, luncheon or dinner parties. 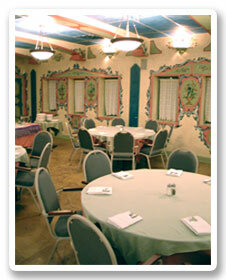 We are pleased to offer many exciting options for your event. 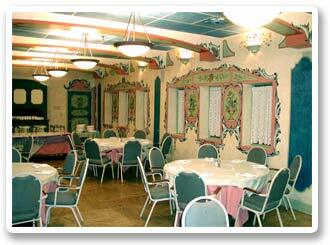 The style of service, buffet, family style or table service is your choice. All options require advance orders. Many wonderful foods are available to combine and create the perfect meal for your group. We also feature fine wines, beers and beverages to complement your food and event. Take a look at our Festsaal Banquet menu (.pdf file). It includes a contract that can be used to reserve the Festsaal for your special event and our most frequently asked questions for banquet planning. We will be happy to help arrange for: audio-visual equipment, flowers, music and musicians, special designers or any other amenity to make your celebration complete.